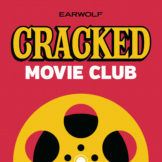 Christopher Nolan month begins on Cracked Movie Club! Magic. Obsession. Fake beards. David Bowie. 2006’s The Prestige is everything you could want from a Christopher Nolan movie, in that it’s a wildly entertaining film whose logic collapses upon repeat viewings. Made just after Nolan had hit the big time with his 2005 Batman reboot Batman Begins, The Prestige pits Hugh Jackman and Cristian Bale against each other as rival magicians in turn of the century London, competing over who can do a superior version of the same trick. Based on a sci-fi/horror novel of the same name, it’s arguably one of Nolan’s most narratively effective films, as well as a showcase of Michael Caine’s formidable ability to deliver expository dialogue in a way that doesn’t feel ridiculous. This week, Tom and Abe are joined by comedian and co-host of The Bechdel Cast Jamie Loftus as they discuss the film’s creatively repeated themes of obsession and duality, the odds of two twins both being super into magic, and Jamie’s mission to wipe all magicians from the face of the earth. This episode is brought to you by Phil (www.phil.us/CLUB).